Our Decorative Banner #7 is a good choice for adding a logo, as is our Decorative Banner #1. We can apply images, logos, or text in the field using optional gold leafing. You can send us your corporate or team logo, your family crest, or any image that appeals to you and we can personalize you weather vane with it. We would be happy to provide you with a quote once we see what you have in mind. 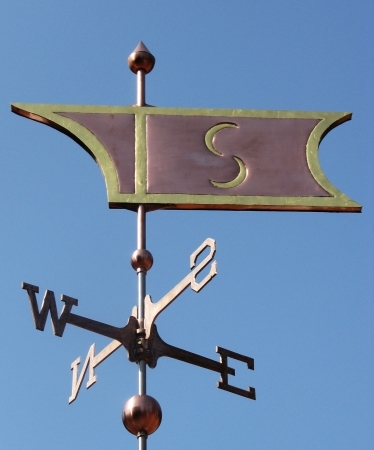 In order to make this Weathervane strong, we employ box style construction. Because the majority of the surface area is to one side of the pivot point on this particular design, the boxed construction of the banner makes it quite a bit stronger in the medium, large and extra-large sizes. Banners began as a fabric herald of a location, event, or family residence. Banner weathervanes came into prominence for identifying locations that are unchanging because of their durability as compared to fabric, which was fragile in the elements and so very labor intensive to replace.